Microsoft spent a fortune tying Vista and Aero Glass together in the minds and pocketbooks of computer consumers. In fact, a large percentage of all Vista Home Basic users upgraded to Home Premium because they wanted to get Aero Glass. But when you get right down to it, do you know what Aero is? Or Glass? The first thing to understand is that Aero and Glass are two completely different display features. Each one imposes a significant overhead on your computer. If you can live without one or the other or both, you can speed up your computer’s performance. 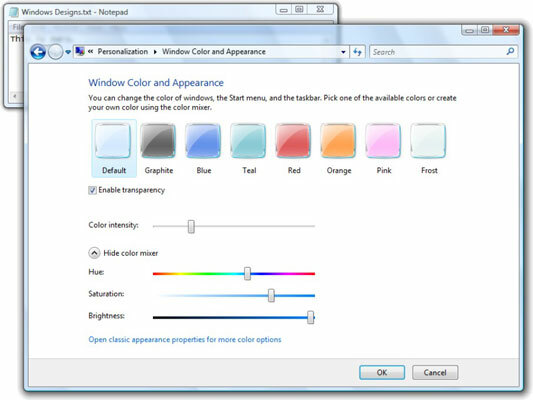 Microsoft calls Aero a color scheme, but that’s like calling the Starship Enterprise a footlocker. Aero is a unique design — sometimes called a shell or a skin — that defines the way windows look on your screen. The best way to understand Aero is to compare it with other window designs. 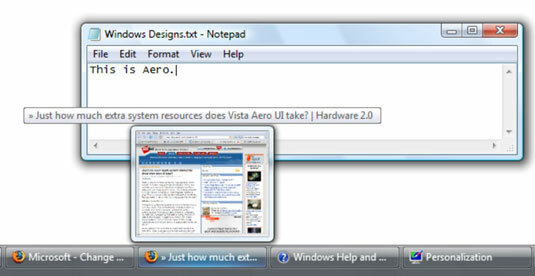 Vista’s Aero shell is quite distinctive in many ways, most noticeably because the control buttons in the upper-right corner of each window sit on the edge of the window; because the “X” button glows red when you hover your mouse over it; and because of the gray shadow around the window. Vista Basic, on the other hand, doesn’t look much at all like Aero: The control buttons sit farther down on the title bar; the “X” button doesn’t glow; and there’s no five o’clock shadow. Vista Basic doesn’t look much like Aero. Windows Standard Shell is still supported by Vista. This shell is identical to what folks used to see in Windows 98, Windows 2000, and other less-mentionable versions. The Windows Standard design has a decidedly retro feel. 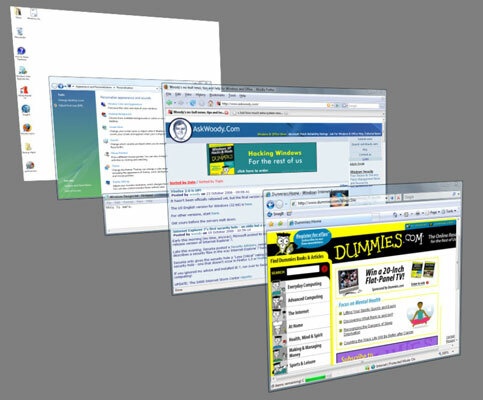 When you hover your mouse over a button in the Windows taskbar, Vista displays the contents of the minimized program. One of the nice benefits of the Aero shell — you can see a thumbnail of programs in the taskbar. You can use “Flip 3D” to riffle through running programs by either holding down the Windows key and pressing Tab or by clicking the Switch Between Windows icon in the Quick Launch toolbar, next to the Start button. Flip 3D works only if the Aero shell is running. In Vista, Glass refers to a transparent (more accurately a translucent) effect that allows you to see through the border around windows on your desktop and look at a blurry version of whatever lies beneath. Most people find Glass worthwhile because it gives a visual clue about the contents of the window immediately below the one they’re working with. The Glass effect lets you see through the border of the topmost window. You can use the Aero shell without running Glass, but you can’t run Glass without using the Aero shell. If you switch to any other shell, Glass doesn’t exist: Borders around windows are opaque, and there’s nothing you can do about it.